Prime Minister Ahmet Davutoğlu said on Wednesday at a school opening in Istanbul in comments broadcast live by state TV that he does not want the conflict in Syria turning into a crisis between Russia and NATO or into a Russian-Turkish dispute. He said though that Turkey, a member of the alliance, will not compromise the security of its borders or airspace. Russia has breached Turkish airspace twice since launching airstrikes in Syria last week. Only two of Russia's 57 airstrikes in Syria have hit Islamic State of Iraq and al-Sham (ISIS) positions while the rest have targeted moderate opposition groups, the only forces fighting ISIS in northwestern Syria, he claimed. Russia began air operations in Syria on Sept. 30 after receiving parliamentary approval. The Kremlin claimed the airstrikes, which followed a military build-up in Syria, aimed to support the forces of Bashar Assad, a long-standing Russian ally, against ISIS. However, Turkey and the West have accused Russia of targeting moderate fighters opposed to Assad, many of which are supported by Turkey and the U.S.
Davutoğlu said Turkey "is ready to work and speak with Russia, Iran and every other country on a political solution," but added that Ankara had a principled stance on Turkey's airspace and border security, Syrian people's requests and the prevention of possible future refugee crises. "We will not compromise in any way our border security and our airspace security," Davutoğlu said, calling on Russia to respect Turkey's sensitivity regarding border and airspace violations. He said Turkish and Russian diplomatic and military authorities are discussing the conditions in which the border violations happened and how long they lasted. "We do not want any tension with Russia, but as I said, awaiting Russia to pay attention to Turkey's airspace, borders and interests in Syria is our most natural neighborhood right," he said. 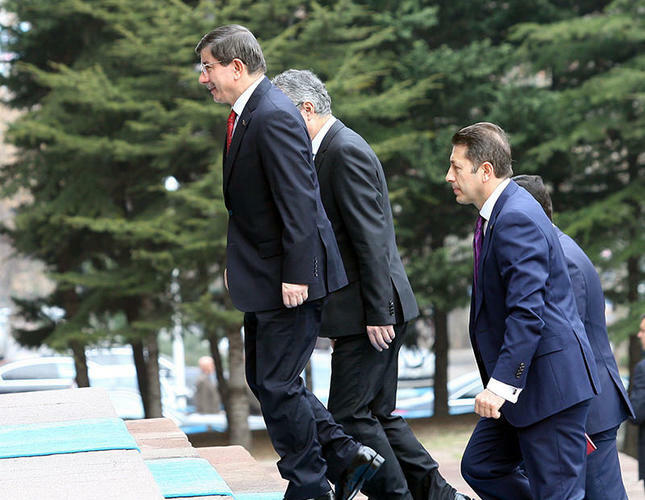 Davutoğlu also blamed the U.N. Security Council, which could not agree on an action plan for being as guilty as the Syrian "tyrant regime" in "the transformation of a country's crisis into a regional crisis." Meanwhile, Russian air strikes have destroyed the main weapons depots of a U.S.-trained opposition group in Syria, their commander said on Wednesday. New strikes targeted the group's main weapons depots in western Aleppo province and completely destroyed them late on Tuesday, its commander Hassan Haj Ali told Reuters on Wednesday via Internet messaging service. "These were considered the principal depots of the Liwa," he said in an audio recording obtained separately. Liwa Suqour al-Jabal operates areas of western and northern Syria where many of Russia's air strikes have been focused and where the ISIS group - the stated target of the Russian air raids - has no significant presence.